More on "The Batman's Crimson Harvest"
The Black Beetle' NIGHT SHIFT is here! superbusy with Swamp Thing and The Black Beetle (with a Shadow and a Spider cover thrown in for good measure) this week so I hope you will forgive me if I re-air this old idea I have about a pulp story with The Batman titled "THE CRIMSON HARVEST". Have a great Pulp Sunday everyone. while I was working on the cover for Dark Shadows #11 thi past Friday, I heard the sad news about the passing of Jonathan Frid, the actor who borught to life the character of the romantic gothic vampire we all love: Barnabas Collins. In memoriam of Jonathan, here's the latest cover for issue 10 and a collage/poster of the first 9 covers I did, all portraying his on-screen character. So long, Jonathan, thanks for all you have done. so excited to announce that the very first chapter of NIGHT SHIFT, The Black Beetle official debut in the comic stores all over the nation, is here: in 2 days you can grab Dark Horse Presents #11 (possibly with the Black Beetle cover) and be there for the beginning of what already appears to be a long and exciting adventure. 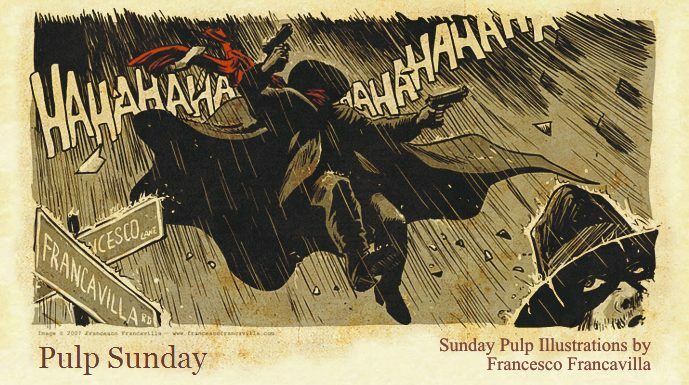 Meanwhile, have a wonderful Pulp Sunday everyone. DHP #11 comes with two covers; if you want to make sure to get The Black Beetle cover (shown on the left) , pls preorder the book at your LCS using the code FEB12 0052. A Vampire's Paper Dolls (Dark SHadows #9 Cover) + EISNER!!! I wanted also to let you all know I have been nominated for the prestigious Eisner Award in the Best COver Artist category, thanks to the covers I have been doing for DARK SHADOWS, LONE RANGER, WARLORD OF MARS, ZORRO, BLACK PANTHER, and ARCHIE MEETS KISS. I can't even express how excited and honored I am to be an Eisner nominee: as someone who has been working in this industry for some time now, it really means a lot.